Beveled edges bring uniqueness to this geometric crystal cube. The cube rests on a cut edge for added style and dimension. This award will be a constant reminder of your inventor's accomplishment. 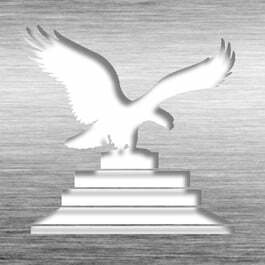 Precision laser-etching on optical crystal produces a beautiful frosted effect deep into the surface, making this crystal cube appears more sophisticated and personalized. Front etching included in base price. Additional (2) sides optional. Available in two sizes: Medium (3" x 3" x 3") or Large (4" x 4" x 4"). Also available with our Black Metal Plate. 3" x 3 5/8" x 3 7/8"
This Patent Award - Crystal Desk Cube IP CC-444 is part of our Patent Desktop Award Series of products, check out other products & options available in the Patent Desktop Award Series of our selection. 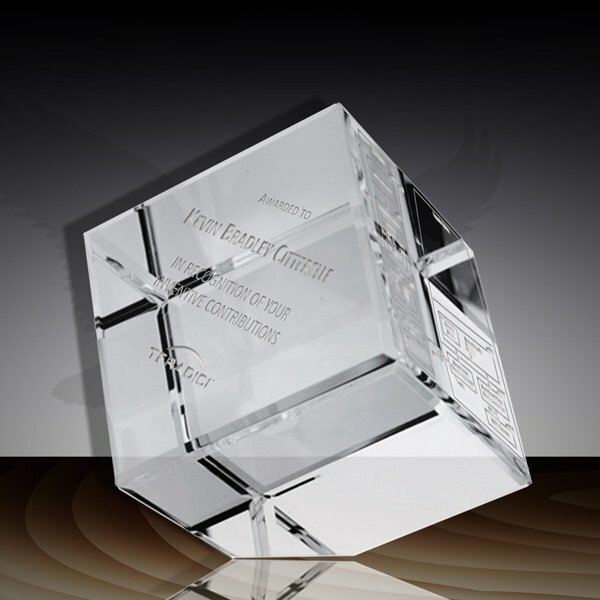 This Patent Award - Crystal Desk Cube IP CC-444 can be modified to your requirements and is available for your corporate award programs.